... is a trained animal psychologist and is entitled to test the proficiency of dog owners in his region. His professional specialism focuses on the psychology and neurology of dogs with particular reference to communicative signals, facial expression (mimic) and body language. Jorg Tschentscher lives in Duesseldorf and also runs his animal psychology practice there. His household includes his two Eurasiers, Lena, a lovable wild-child and Pablo, the wonderful miniature macho with mischievous assertiveness. Over the last decades the dogs’ habitat has changed. Previously they were guardians, hunting assistants or sheepdogs. 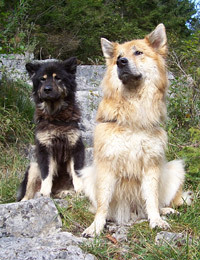 Today they are usually companions, social partners, sporting buddies and family members. Dogs have adjusted to this way of life admirably. However, they still have their genetic inheritance, their own needs and their own ways to communicate (mimic, body language). Another remarkable aspect: dogs and humans share 90% of their DNA; dogs develop in similar phases to humans. They go through puberty - triggered by the same gene (GPR54) as in humans - they can be jealous, overdo it or occasionally misunderstand things. Additionally, every dog is unique, has its own character, its own ways. All this must be taken into consideration when dealing with a dog.